With the national political climate threatening civil rights and equality for our LGBTQ+ community and a statewide effort in Massachusetts to repeal protections for our trans community, we have the chance to stand up in support of LGBTQ+ youth. The Boston Alliance of LGBTQ+ Youth (BAGLY, Inc.) has been supporting Bostonians for over 38 years and just moved into a 5,000+ square foot LGBTQ+ youth community center! With better access to public transportation, accessibility for all, and planned expansions to their youth leadership development programming, BAGLY expects thousands of young people to use the center and its programs each year. It is always the time to make sure LGBTQ+ youth leaders have their voices lifted up and supported. Together we can make sure that Boston lives up to its reputation as a safe city for LGBTQ+ youth. 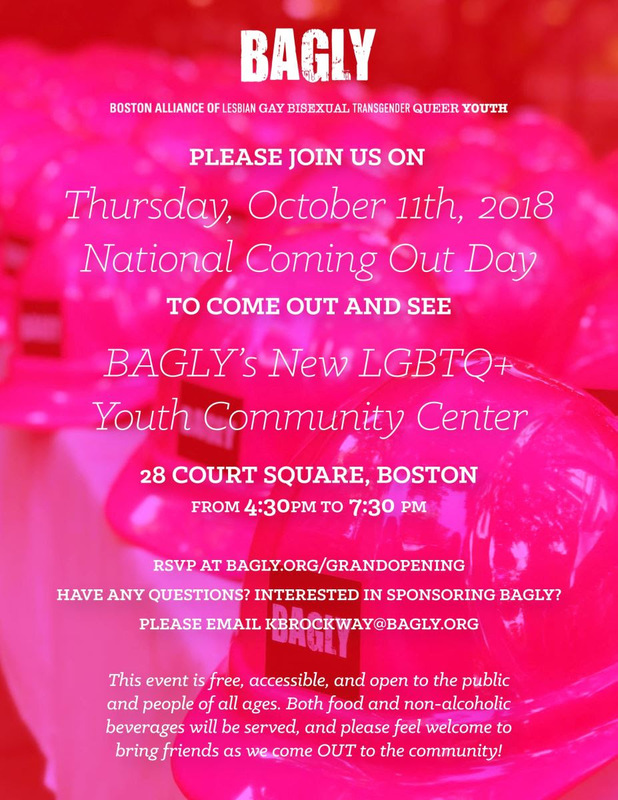 Please consider helping BAGLY celebrate Boston's new LGBTQ+ youth community center with a donation. Every $10 helps provide health care and counseling in their free clinic, every $20 buys meals for youth in the drop-in, and every $50 trains another youth speaker how to tell their personal story and create change. Or consider joining BAGLY’s monthly donors, the Unicorn Society: for $5 a month you’ll join a core group of grassroots supporters who help keep BAGLY’s LGBTQ+ youth community center stocked with food and supplies for youth leaders. And it wouldn’t be a celebration without a party, would it? BAGLY is inviting everyone to join in on National Coming Out Day, October 11th, 2018, for the grand opening of LGBTQ+ youth community center. Please visit www.bagly.org/grandopening to RSVP and for more details!